Last weekend I was able to attend the Portland Retro Gaming Expo (PRGE) in Portland Oregon. For those of you who are not aware of this show, it has grown to be one of the largest shows in the country. As they normally do, they had a large Retrocade area set up where you could play any number of arcade games or games on home consoles. This year, the Retrocade area opened on Friday at noon and was extremely popular. The largest area of the show is reserved for exhibitors. These varied from vendors selling all kinds of retro game items to vendors selling new games for retro systems to vendors with announcements for new retro game systems. I had a change to support AtariAge with show preparations and I worked the booth for a few hours on Saturday. One of best things at the PRGE is the panels and speakers that they are able to attract. I was able to attend a session with Atari and Activision developers. A couple of new retro game systems were announced. CollectorVision announced a Kickstarter Campaign for their new FPGA based ColecoVision compatible system. Also, Intellivision Entertainment announced plans to release a new console that will have ‘Re-imagined’ Intellivision games built in. One of the best things about PRGE for me is the release of new games for retro systems. AtariAge had several new 2600, 5200, 7800 and Jaguar games released at PRGE this year. AtariAge had a number of Atari systems set up to demonstrate existing, new, and work in progress games. The absolute highlight of PRGE for me was the chance to meet and talk with legacy programmers like David Crane and Dan and Gary Kitchen as wells as folks that make new Atari games possible like Al Yaruso of AtariAge and Fred Quimby who designed the Melody board. It was also a blast to talk with John Champeau and his brother Paul about the development of Mappy and Champ Games upcoming game Wizard of War Arcade for the Atari 2600. If you ever get the chance to be in Portland in late October, make sure that you carve out some time to attend the PRGE! Categories: 2600, 5200, 7800, Atari, Colecovision, Intellivision, Uncategorized | Tags: Atari, Colecovision, game, Intellivision, retro | Permalink. I recently had the chance to visit the National Video Game Museum in Frisco, Texas. The museum is located just north of Dallas at the Frisco Discovery Center. The National Video Game Museum is only one of several attractions at the Frisco Discovery Center which also hosts the Museum of the American Railroad and the Train Topia model train layout. I wasn’t sure what to expect from the NVG museum, but I was very impressed with my visit. There we all kinds of home game systems available to be played as well a small retrocade. In fact, they give you a few tokens for the retrocade as part of your admission to the museum. A couple of really cool displays showed the various versions of Frogger and their collection of boxed Activision games. I also really enjoyed the store displays. The one representing the video game crash of 1983-1984 brought back some not so good memories. The Atari 2600 store kiosk brought back some better memories! I was also really impressed with the display of video game related board games. I didn’t even know this many were produced! If you are ever in the Dallas and have a couple of hours to spare, the NVG Museum is well worth a visit! Categories: 2600, Atari, Colecovision, Intellivision | Permalink. I want to wish everyone in Retrogame Land a very Happy Holiday Season! The second half of 2014 was incredibly busy for me and there was just not enough time to keep up with this blog. I have some down time between the holidays and hope to get a few posts done. There has actually been a lot going on in Retrogame Land in the past few weeks. Over at AtariAge, several new 2600 and 7800 games were released. For the Atari 2600, Omnicrom, Pinata, and Flappy were released in November and just a couple of weeks ago Threes, the 2014 Holiday cart ‘The Byte before Christmas’, and Stay Frosty 2 were released. I have gotten my hands on Stay Frosty 2 and will have more to say about it in an upcoming blog. For the Atari 7800, Astro Blaster and K. C. Munchkin have been released. These are currently sold out, but should be available again in January. Several new 2600 games are also in development including Draconion by Darrel Spice and an amazing new version of Pac-Man by DINTAR816. For the 7800, Bob DeCrescenzo is developing a scrolling zombie themed game called Rezolve and Schmutzpuppe is developing a version of Flappy Bird. AtGames has released the Atari Flashback 5, the Colecovision Flashback, and the Intellivison Flashback. The Atari Flashback 5 now comes with 92 built in games while the Colecovison and Intellivision Flashbacks each have 60 built in games. They are available from many retailers including Dollar General, Toys R Us, Bed Bath & Beyond, and Sams Club/Walmart. I have been able to get my hands on both the Colecovison and Intellivision Flashbacks and will have reviews of these units posted in the next few days. Again, Happy Holidays and I will have some more posts in the next few days! Categories: Atari, Colecovision, Intellivision | Tags: Atari, Colecovision, Intellivision | Permalink. Donkey Kong is a 1981 video game developed by Nintendo and is one of the earliest successful platform games. Although there had been a couple of other platform arcade games, Donkey Kong was the first to introduce jumping. Programmed by Shigeru Miyamoto, Donkey Kong was a monster hit that established Nintendo as a serious player in the video game market. There are four different ‘platforms’ in Donkey Kong: The construction scene, the cement factory, the elevator scene, and the rivets screen. The goal in Donkey Kong is, essentially to climb to the top of the screen and rescue Pauline. Only in the rivets screen is this different where Mario needs to knock out all of the rivets. At the time that Shigeru developed Donkey Kong, it was a radical departure from the space shooters and maze games that had been dominating the video game market. In fact, Nintendo America was not sure that it would be successful. The Nintendo America staff is credited with naming the characters in Donkey Kong. Originally they were only known as Jumpman and Lady. They renamed them Mario and Pauline and had graphics made for American versions of the arcade cabinets. They tested a couple of Donkey Kong arcade units in a couple of bars and, much to their surprise, the public loved the game. They ended up converting over 2000 surplus arcade units into Donkey Kong units and the rest is history. Donkey Kong went on to become one of the most popular and most recognizable game franchises in history. 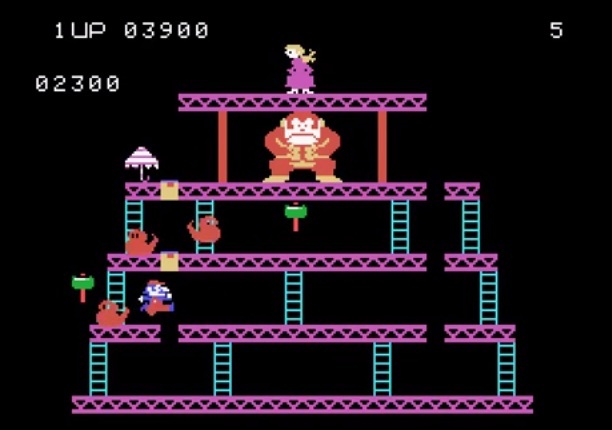 Donkey Kong was ported to a number of home game consoles and computers including the Colecovision, the Atari 2600 and 7800’s, the Intellivision, and the Atari 8-bit computer line. Coleco won the rights to produce cartridge based home console versions of Donkey Kong and decided to make it the ‘pack in’ game for their system which helped them sell over six million consoles. 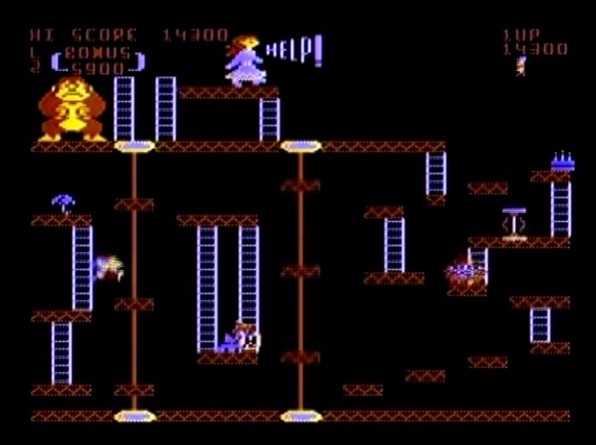 The Colecovision (CV) version of Donkey Kong featured three of the arcades screens (the cement factory was left out home console versions) and no climbing or intermission screens. The graphics were impressive, but the game was a little too easy to play. In the elevator screen, Kong doesn’t throw any barrels, which makes this screen incredibly easy compared to the arcade version. Still, the CV version was impressive for the time (1982). Coleco also ended up producing Donkey Kong for the Atari 2600 and Intellivison. Gary Kitchen programmed the 2600 version of Donkey Kong for Coleco. I had the chance to meet Gary last year and hear him talk about the development of this game. He was only authorized to make a 4K non-bankswitched game, so he was very limited with what he could do. He managed to get two levels (Construction and Rivets) into the 2600 version, but the graphics (impressive for the 2600) were no match to the CV version. 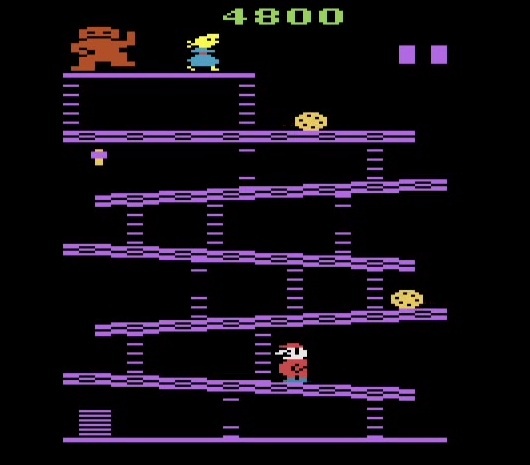 Gary managed to capture essence of Donkey Kong, but it is not one of the better games for the 2600. Today, there are two new homebrew 2600 efforts underway: Donkey Kong Arcade and Donkey Kong VCS. Both feature improved graphics and sound, all four screens, and intermissions. The developers of these games have taken different approaches, but both are creating awesome versions for the 2600. Due to Nintendo’s licensing policies, these will probably not be able to be made commercially available, which is a real shame. However, if you have a Harmony cart, you can try out the prototype versions of these games on your 2600. Coleco did not develop a 5200 version of Donkey Kong, probably as they saw the 5200 as the main competitor to the CV. Fortunately, Atari had obtained the rights to produce home computer versions of the game and developed an excellent port for their 8-bit line. Atari’s 8-bit version has all four screens and well as the ‘how high’ intermission screens. The 8-bit version has been converted to run on the 5200 and can be played on the Atarimax cart or can be obtained in cart form. Playing Donkey Kong with the 5200’s analog joysticks takes some adjustment, but it turns out to be one of the better games for the Super System. The game also takes advantage of the 5200’s Pokey chip to produce near arcade quality sound. The 7800 version of Donkey Kong was released in 1988 and is an excellent good port of the game. As with all of the home console versions, it is missing the Cement Factory screen as well as the climbing and intermission screens. Also, like most 7800 games, the sound could have been better had Atari included a Pokey chip in the cartridge. Even with these limitations, the 7800 version of Donkey Kong is probably the best original port of the game for a home console and demonstrates the 7800’s home arcade capabilities. 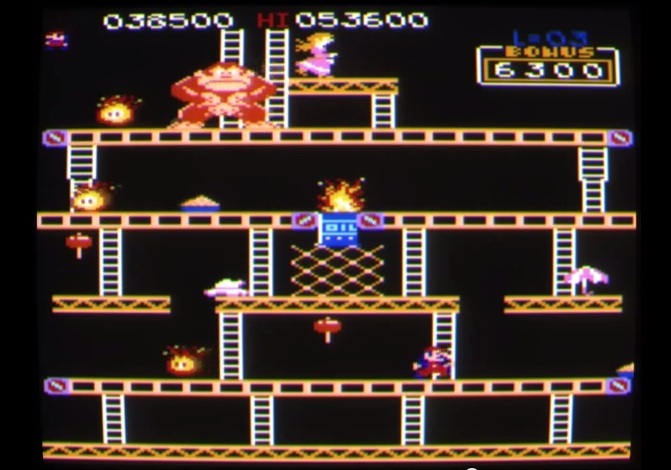 Thirty years after the release of the 7800, a new version of Donkey Kong is now available for the Pro System. Perry Thuente spent over a year working on improving the 7800 version. Originally, he had only intended to develop a version that would improve the sound by taking advantage of Atari’s Pokey chip that will be in the XM expansion module. One thing led to another, and Perry ended up completely re-building the game. He has added the climbing and intermission screens as well as the missing cement factory level. He also improved the graphics and added the ability to play the game in either the Japanese or US arcade order. Perry’s version is called Donkey Kong XM and needs the XM module in order to hear the sound. Unfortunately, the delivery of the XM module has been delayed. Also, due to Nintendo’s licensing policies, Perry can’t make this commercially available and is only making a few copies of the game for friends. Since the XM module has been delayed, Perry has made a handful of Donkey Kong PK cartridges which take advantage of CPUWIZ’s Versaboard and include a Pokey Chip. This version produces arcade quality sound on a stock 7800. Being one of the lucky ones to have a copy of Donkey Kong PK, all I can say is wow! The only way to have a better home version of Donkey Kong would be to put an actual Donkey Kong arcade cabinet in your house!!! If you are a Donkey Kong fan, there are no really bad versions of the game and they are all readily available. The Colecovison, 2600, and 7800 versions are plentiful and cheap, but a copy of the 5200 version on cart will set you back a few $$$ (however, is a pretty awesome game for the 5200!). Perry’s Donkey Kong XM or PK version is, however in a league by itself. If you own a 7800, and are a fan of Donkey Kong, then you simply need to get yourself a copy of this game. Make friends with Perry and convince him to make you a copy. Also, if you are a 2600 fan, don’t forget about the new versions of Donkey Kong that are nearing completion! Categories: 2600, 5200, 7800, Atari, Colecovision, Game Reviews | Tags: 2600, 5200, 7800, Atari, Colecovision, Donkey Kong, VCS | Permalink.